makes the eye teary. I had to quickly finish this under low-light conditions. IN the days before cooking gas was available, charcoal and wood were the preferred fuels for cooking. There were two types of charcoal sold in sundry shops – soft charcoal, which is cheaper and usually made from any type of wood, and the hard charcoal, made from mangrove logs. The latter is denser and much more preferred as it produces fire that burns hotter and longer than the soft charcoals. Located in Kuala Sepetang (or Port Weld as it was originally known) along the coast of Perak, some 17km from Taiping, the charcoal factory owned by Khay Hor Holdings is one of the few remaining ones in the Peninsula that produces the higher quality mangrove log charcoal. 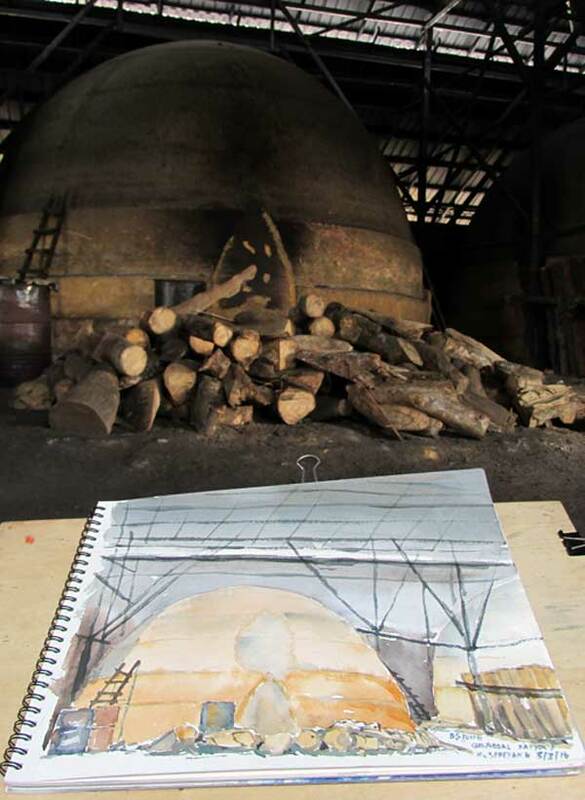 I was fortunate enough to be allowed into the factory to sketch one of the igloo shaped kilns made of bricks. Unfortunately the charcoal was still being made and not ready to be removed, so I did not get to go into the kiln. Khay Hor Holdings business development manager K.Y. Chuah informed me that the entire process of making charcoal takes about 30 days. Mangrove or bakau logs are stripped of their bark, cut into approximately 1.6m lengths, and arranged upright along the walls of the seven-metre high kiln. A fire is lit and the entrance to the kiln, which is about the height of a man, is gradually sealed over a period of time. Heat control through gradual sealing of the aperture is very important so that the charcoal is not reduced to ashes because of too high temperature. The heat had to be built up to produce a high quality charcoal that burns efficiently. “There are two stages of fire which we create. The first stage is the ‘big fire’ and the second, we call ‘small fire’. From the ‘big fire’, we will partially seal the entrance to create a ‘small fire’. asked to see my sketches. “During the first stage, the ‘big fire’ will be allowed to run for approximately ten days. 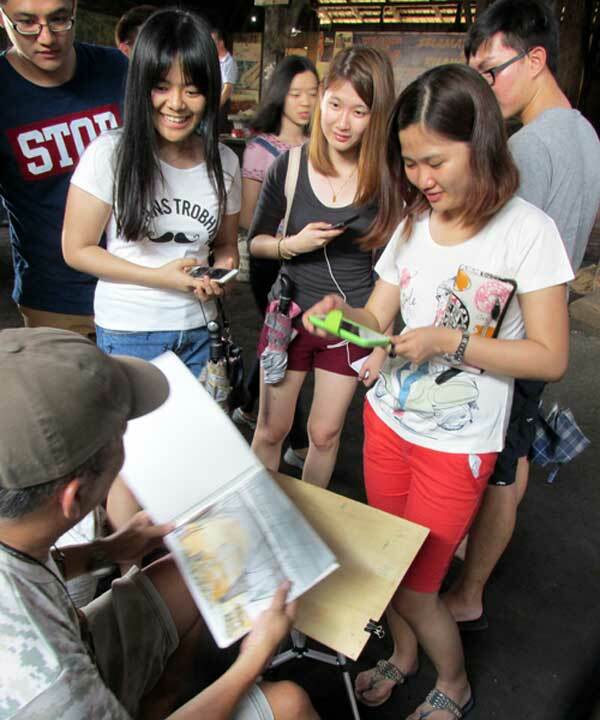 The temperature is raised until it reaches 85-degree Celcius,” added Chuah. “Subsequently, this ‘big fire’ is converted to ‘small fire’ and this is kept going approximately for 14 days. The temperature would now be between 230- and 250-degree Celcius, after which the fire is extinguished by sealing all the apertures of the kiln. “Once the fire is extinguished, it takes about a week for the charcoal to cool down before they can be removed from the kiln,” he added. The job is done manually. During the process of firing, steam is released from the mangrove trunks escapes from the kiln through a vent on the roof. This steam condenses into a smoke-smelling dark brown liquid which is believed to have antibacterial properties and is sought after for medicinal application. In the past, kiln workers collect this black liquid to treat skin diseases and remove odour from shoes and old socks. Today, this charcoal maker has taken a step further to refine the extraction of this liquid by a filtration process, with the end product marketed as mangrove vinegar. 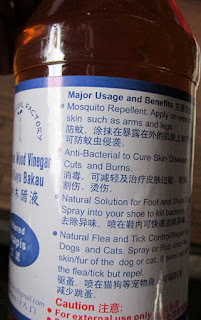 According to Chuah, the vinegar can be used to freshen up stale air in a room, as mosquito repellent, and even used to treat certain infections of the skin. “Because it has strong anti-bacterial properties, you can use it to remove the odour from your shoes. Just spray it into the shoes and leave them overnight to make your shoes smell like brand new. “Since this is an organic product, you can also spray it on your pets, like dogs and cats, to repel ticks and fleas,” he added. Apart from the mangrove vinegar, his company has also produces charcoal soaps for bathing and cleansing purposes. “This black soap is most effective in removing blackheads and cleaning the skin,” he said. Mangrove charcoal blocks too are sold at the factory grounds for use as an air purifier as well as décor for the home.